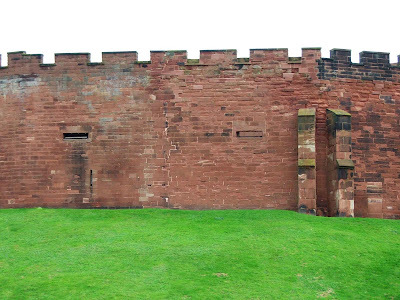 Sandwiched between the River Dee to the South and the race course to the West, Chester Castle is a mere shadow of its former self. All that remains of the once powerful Norman motte and bailey castle is the motte, rising to around 70 feet, with a summit measuring some 50 feet, the Agricola tower dating from 12th century, and various portions of castle wall, all refaced during the late 18th and early 19th century. 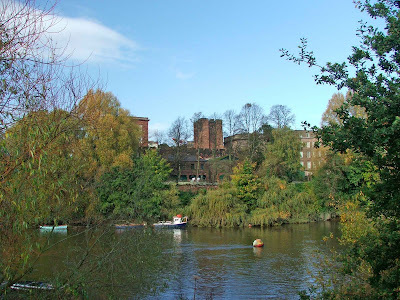 The castle can best be seen from Castle Street, from the wall walk, and from across the River Dee in St Edgar's Field. 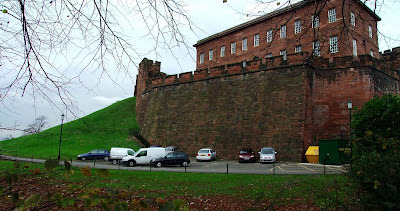 All that is immediately visible, is the huge grass covered motte, erected in 1070 by William the Conqueror, and the red sandstone walls that top the mound. The above photo shows the castle from the South, from the wall walk. The above photo shows the South West corner of the motte, with the walls and the canon slits. The Flag tower, not seen on this visit, is one of the original towers built to protect the summit of the motte. It is now in ruins. The Agricola tower would also be in a poor state of repair, but it has been refaced over the years, and is now in a good state of repair. 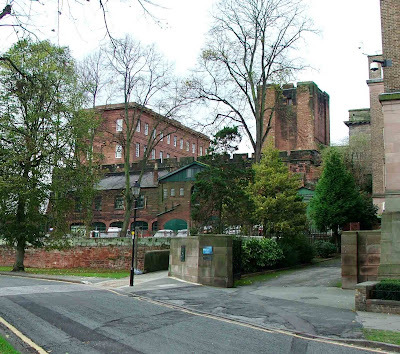 The Agricola tower still contains a consecrated chapel, dedicated to St Mary de Castro, and in use as a regimental chapel, used by the Cheshire Regiment. A view of the castle from the West, showing the full extent of the re-fortifications on 1745, including the small round tower with the blocked up windows. 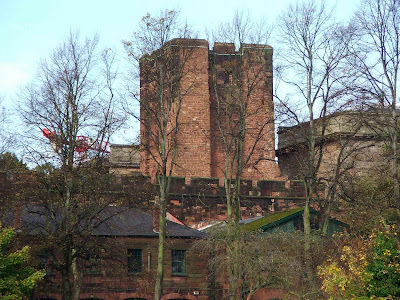 The Agricola tower can be seen towering above the Thomas Harrison designed buildings (erected between 1788 and 1822) along with the gun emplacement, a stretch of walls on top of the motte with huge cannon slits built in 1745 when the Jacobites were thought to be heading towards Chester. Castle Wales information on Chester Castle. The photos you took and put up are marvelous to show what's left and what took the place of what has been removed. I found a wonderful Sam and Nath Buck engraving during my search on Chester Castle and the walls. 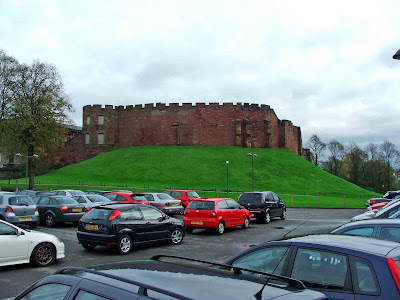 I'll put up a link to this blogpost when I put up my complete entry on Cheshire County soon. Thanks for the look !